The banners, cutouts, posters and flags – illegal except in offices of candidates – are the only signs that tell the story that elections are round the corner in just 12 days. Those very busy are only the candidates and their supporters. The police are otherwise busy too. With money from the Department of Elections in their pockets, they hire labourers to pull down cutouts, posters and other propaganda material. Even worse is how they remove posters from walls and lamp posts. No sooner a few of them are pulled down than hordes re-appear. The men and women for whom these drams are being enacted – the voter – is busy too. The difference is that it is not over the polls. They are preoccupied with their own problems. No doubt, the occasional confrontation between feuding factions or crowds being influenced to throng meetings exist. So does the extensive use or abuse of State vehicles and resources. Millions are changing hands every day as candidates vie with one another to become provincial councillors – a position that not only provides them perks but also positions. Only 122 from a total of 3,073 will be eligible for those politically privileged positions. This is the picture that emerges as we drive through the three provinces – North Central, Sabaragamuwa and Eastern – where 2,076,417 voters eligible to vote will go to polls on September 8. In the Polonnaurwa District alone, some 95,000 acres of paddy are cultivated every Yala season. But, about 28,500 acres have already been damaged. “We have to blame the authorities for the crop failure as they failed to manage the available water resources. They released the water for farming well in advance before we were even ready to cultivate,” says farmer organisation leader K. Dharmatillake. However, Polonnaruwa District Secretary Nimal Abeysiri refutes the allegations. The farmers had wasted water when it was released, he says claiming that only 30 per cent of the cultivated area was damaged by the drought. “They did not cultivate on time. Some of the farmers waited to celebrate the National New Year to start cultivation. We released the water in time and a section of the famers failed to make use of the water,” he says. Besides the loss of paddy harvest, some farmers also lost other crops, such as tobacco and onions. Ananda Edirisuriya, president of a farmer’s association in Elhera, says the farmers were advised not to cultivate paddy and, therefore, they took to cultivate tobacco and onions. But these crops too were affected by the drought. However, politicians are quick to seize the opportunity and offer assistance to farmers. The freebies include farm implements such as mammoties, pesticide sprayers and water pumps. In Welikanda, 30 kilometres off Polonnaurwa town, the provincial Health Ministry organised an event to distribute Thriposha — a food composition with nutritional value for children and pregnant women. Coinciding with the event, a former minister was due to address a meeting at the same venue. Although some 500 persons – mostly pregnant women — were expected to participate in the event, only 100 turned up. Angry and disappointed, the organisers warned those attending the event that the Thriposha supplies would be stopped. The crowd protested against the move. The JVP, which learnt about the incident, has lodged a complaint with the Assistant Elections Commissioner in the district. In another stunt, the Housing Ministry is distributing forms for loans for construction of houses. Even those who already have houses have been told they could send in their applications.Besides, at meetings with politicians, free food is distributed for the participants. These are some of the instances of election law violations committed largely by ruling United People’s Freedom Alliance candidates, some of whom are seen blatantly misusing state resources. The worst culprits appear to be Cabinet Ministers whose kith and kin are contesting the elections. Their ministry vehicles are seen engaged in campaign-related work. In addition, a number of vehicles with garage numbers too are operating freely, mostly in the Anuradhapura district. Anuradhapura District Secretary Mahinda Seneviratne says they have received complaints regarding the use of state vehicles for election campaigns and vehicles operating with garage numbers. “We have deployed teams at the entry points to Anuradhapura town and at the main access roads to the district to take note of the vehicles that display stickers and posters and detect vehicles operating with garage numbers. I have also advised the officials to follow these vehicles and inform the respective parties to remove such illegal propaganda material on vehicles,” he said. However, it appears these measures have not helped much as vehicles with stickers and posters are still commonplace. President Mahinda Rajapaksa last Saturday addressed the inaugural campaign rally in Anuradhapura district where he expressed confidence in winning in all three provinces. The voter interest in the elections in Sabaragamuwa is no different to that of the North Central Province.It is mostly the politicians, including ministers whose relatives are contesting the elections, who are keeping up the interest. Technology and Research Minister Pavithra Wanniarachchi is one of them. She is canvassing for her husband Kanchana Jayaratna, a UPFA candidate, and for the party. “We feel that the people are satisfied with the development activities, particularly the roads and infrastructure development projects,” Ms. Wanniarachchi tells us as she attends a meeting with her organisers in the Boralugoda village, 15 kilometres off Eheliyagoda. But, Ratnapura district UNP candidate Ananda Palliyaguru claims that many of the UPFA supporters are turning up to join the UNP because they are hit by the increasing cost of living. Pointing to the wide display of banners and other propaganda material, he charges that UPFA candidates show scant respect for election laws. Pushpakumara Dissanayake, the JVP’s Ratnapura District chief candidate, says the roads which the government is boasting about have failed to increase production or generate employment. “If the government thinks building roads will boost its popularity, it is wrong. It will realise this in this elections,” he said. Compared to previous elections, the Police along with the District Secretaries have initiated action to pull down cutouts and banners and remove posters. Yet, questions are being asked how some candidates’ posters and cutouts remain intact, especially those of UPFA stalwarts’ kith and kin who are contesting the elections.“It is not an easy task to clear illegal propaganda material. As soon as the police remove the posters, another set of posters appear on the same wall. 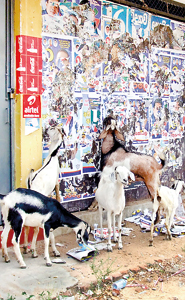 In every neighbourhood, a supporter of a particular candidate keeps a set of posters in his house to do this job,” says Ratnapura District Secretary Sunil Kannangara. Mr. Kannangara says he has also put on hold all transfers and recruitment until elections were over. In some instances there has been prompt action from the District Secretary when complaints are lodged about the misuse of state property. In Ratnapura orders were issued to the police to seize 12 state vehicles which were being used by former provincial council ministers though they were due to return them soon after the dissolution of the councils. Senior Superintendent of Police N. K. Padmasiri says there have been only a few minor incidents including cases of carrying out illegal campaigning. “This is mainly due to an awareness programme we conducted among candidates,” he says. But, the People’s Action Front for Free and Fair Elections (PAFFREL), an election monitoring group, pointing to appointments, free distribution of meals and propaganda material, says polls law violations are rampant. Kegalle’s District Secretary Thusitha Wanigasekara says he also has initiated action to prevent misuse of state resources for election purposes. “We have advised ruling party politicians not to misuse state vehicles. If there is information about the abuse of state property, we act upon it promptly,” he adds. But, election monitors do not agree. They say abuse of state vehicles is rampant in the Kegalle District, too. The Eastern Province does have some different characteristics. The Sri Lanka Muslim Congress (SLMC), a constituent partner of the UPFA government, is contesting on its own. The party has been locked in internecine battles with other pro-government Muslim parties. Clashes between SLMC members and supporters of Local Government and Provincial Councils Minister A.L.M. Athaullah have marred the campaign in the province. Tension rose to a peak on August 13, the 24th day of fasting in the Muslim holy month of Ramadan. An Iftar, a religious observance to break the fast was organised by three SLMC candidates and their supporters in Akkaraipattu, considered the stronghold of Minister Athaullah. Justice Minister and SLMC leader Rauff Hakeem was due to attend the event. However Athaullah supporters protested against the move to invite Mr. Hakeem saying it would amount to political propaganda. Heated arguments followed and both sides pelted stones at each other. Senior Deputy Inspector General Pujitha Jayasundara, who is in charge of the Batticaloa District, got in touch with, Mr. Hakeem and appealed to him not to attend the event as it would politicise a religious event. He also urged Mr. Athaullah not to go to the location as it would raise political tension. However immediately after the Iftar, which was held on the Akkaraipattu–Kalmunai main road, tension was rising again. Three vehicles belonging to SLMC supporters were attacked soon after the Iftar ceremony ended. In turn SLMC supporters damaged two offices belonging to Athaullah supporters. Police teams were rushed to the area to defuse the tension and teargas was used to disperse the crowds. The incident remains the most serious case of election violence in the district to date.The rivalry has spread to Batticaloa as well. This week supporters of Minister Athaullah and former Minister Ameer Ali contesting from the UPFA held a protest and set fire to an effigy of Basheer Cegu Dawood, a Deputy Minister and Chairman of the SLMC. 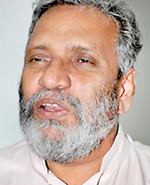 He resigned from his deputy minister’s post on Thursday amidst speculation of further splits within the SLMC.While some say the SLMC’s decision to contest the elections on its own contribute to the tension in the province, Nazeer Ahamed, SLMC’s chief candidate for Batticaloa District, says he believes the decision has contributed to a reawakening of the party. SLMC campaigners justify their decision on the basis that it has provided them an opportunity to highlight an increasing number of harassments meted out to Muslims in various parts of the country. But the party’s rank and file is confused. They ask what would be the party’s position after elections: ‘Will it back the UPFA or remain independent?’Mr. Ahamed says the SLMC might negotiate with the UPFA, but this will be done in a manner that it will not compromise the rights of the Muslims. “We are confident that the SLMC will become the deciding factor in forming the council in the East,” Mr. Ahamed says. The Tamil National Alliance (TNA) which is contesting elections in the East for the first time in the 22-year provincial election history has added interest into the campaign. The party’s candidates and supporters have already faced a string of incidents of threats and intimidation allegedly from supporters of former Chief Minister and Tamil Makkal Viduthalai Puligal leader Sivanesathurai Chandrakanthan who is contesting on the UPFA ticket. TNA Parliamentarian Pon Selvarasa who is spearheading the campaign in the Batticaloa district says TNA supporters have been assaulted and subjected to threats, intimidation, while propaganda material have been seized and vehicles stoned. He says, however, they are happy to note that the police have acted promptly in some cases once a complaint is lodged. “In one incident, two persons on a motorcycle assaulted a TNA candidate campaigning in Kaludavalai, Batticaloa this week. The Kalawanchchikudy OIC arrived on the scene and was able to track down the motorcycle to the nearest TMVP office. The suspects were arrested,” he says. Mr. Selvarasa says the main issues of their campaign are the compensation to people affected by the conflict and resettlement. “We have the right to educate the public about our policies. If we do not have the right to do this there is no democracy,” he says. “The government is trying to give a false sense of development. 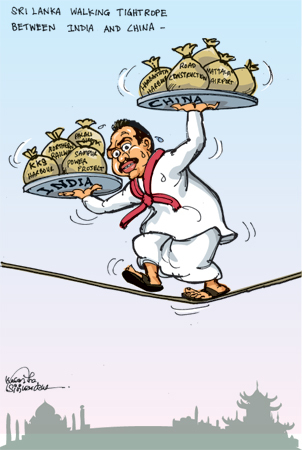 The government is only the implementing agency for development projects,” Mr. Selvarasa says, referring to various projects including the proposed laying of foundation stone for the Rs 1.6 billion Japanese-funded Manmunai bridge. The 200 metre bridge will ease travel problems of tens of thousands of villagers who use the ferry to cross the lagoon. Democratic People’s Liberation Front (DPLF) leader Dharmalingam Siddarthan, whose party is backing the TNA, is personally present in Batticaloa to oversee the campaign. “Our message to the Tamil voter is to come out and vote. If people come out and vote we have a good chance,” he says..
“We have to make use of the result so that the government could be persuaded to find an early political solution. This is the message we want to give to the international community”.“Those canvassing for us say that President Barack Obama is watching the process. This is done to encourage the voters to cast their vote,” he adds. 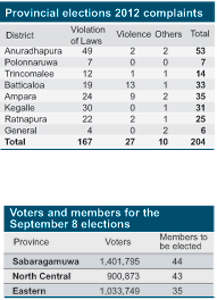 So far the Batticaloa district has recorded the most number of violent incidents in the run-up to the polls. Of a total of 27 incidents 13 have been from this district. However, Batticaloa District Secretary P.S.M. Charles says that in coordination with the Police they have been able to identify problematic areas, intensify police mobiles and strictly enforce the rules on posters and other propaganda material. Both, the UPFA and the UNP are set to be affected by the decision of the two main minority parties to contest on their own. In the 2008 elections the SLMC contested under the United National Front (UNF) led by the UNP. Also in the absence of any main Tamil party at the 2008 elections the UNP had the advantage of gaining Tamil votes. In a similar manner, the UPFA was also able to draw a share of the Tamil votes because of the TMVP’s presence. However, this time with the TNA contesting the elections, there could be a major dent in the TMVP vote share, observers say. The preparations for next year’s Deyata Kirula – an annual state exhibition on development — in the Eastern Province and Polonnaruwa district are being misused for the election campaign, opposition parties claim. The plaque for the exhibition site has already been put up a short distance away from Ampara. A policeman has been placed to guard the plaque. “We are concerned because the government on the pretext of the Deyata Kirula is offering various facilities. For instance, it is carrying out a survey on the housing needs and offering people various facilities and promises,” Wasantha Piyatissa, the JVP’s Ampara district leader says. The incidents of violence and election related offences have been relatively low compared to previous provincial or national elections. Only 204 complaints and incidents have been reported since nominations closed on July 19. Of them, 167 are on violation of election laws and 27 relate to violence. A large number of election law infringement were reported from the Anuradhapura district and the most number of incidents of violence have been recorded from the Batticaloa district. Though the incidence of violence low at the moment we are expecting that there would be an increase of such incidents towards the end of the campaign. There are internal rifts as well. Even my party office in Panama, was attacked by our own party supporters. Therefore we have to be watchful of the situation. The voters are impressed with the development work we have done in the area and therefore we believe that the voters will re-elect our party to the provincial council. Though the SLMC is contesting separately we have no problem in winning the elections. Besides, we are confident that the SLMC will support the government. Our campaign in the Eastern Province is based on a range of issues. In the urban areas we are concentrating on issues such as the crisis in the education sector, the university issue and corruption. Though this is a provincial election, we believe that these issues matter for the people in the urban area. However, in rural areas, we are concentrating on the cost of living and food prices. There have been instances where TMVP supporters have intimidated UNP supporters, and so far the Police have acted on the complaints they have made. We are urging the voters to vote for a change and give the UNP an opportunity to rule the council. A major rally of the UNP attended by leader Ranil Wickremesinghe and other senior members will be held on September 1. The people are disillusioned with the government. If you take the Ampara district there are a series of problems the people face. The farmers are unhappy; they cannot sell their crop and the cost of living is unbearable. The increase in fuel prices has affected the farmers and they are unable to pay back their loans which they have taken for cultivation. Another serious issue is the treatment meted out to home guards. They were treated as war heroes during the fight against the LTTE. They are now being used to make bricks, harvest sugar cane and menial work. The UNP hopes to win seven of the 14 seats in the district. There is a lot of communal campaigning being carried out in the district. Our appeal is that the parties should not rouse communal feelings during the campaign.�There are lots of false promises being given to the voters. For instance, officials from Wimal Weerawansa’s ministry are going out to offer housing loans. We have complained about such illegal activities. Our campaign is ‘Janasatanata Nawa Jawayak’ (New vigour for the people struggle). The party is gaining more votes as some members who broke away from the party are rejoining us.